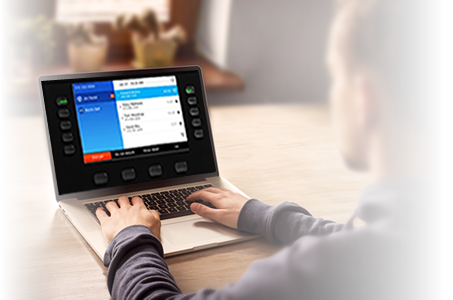 Remotely control Cisco IP phones from your desk. Login users remotely, place calls and change phone settings. 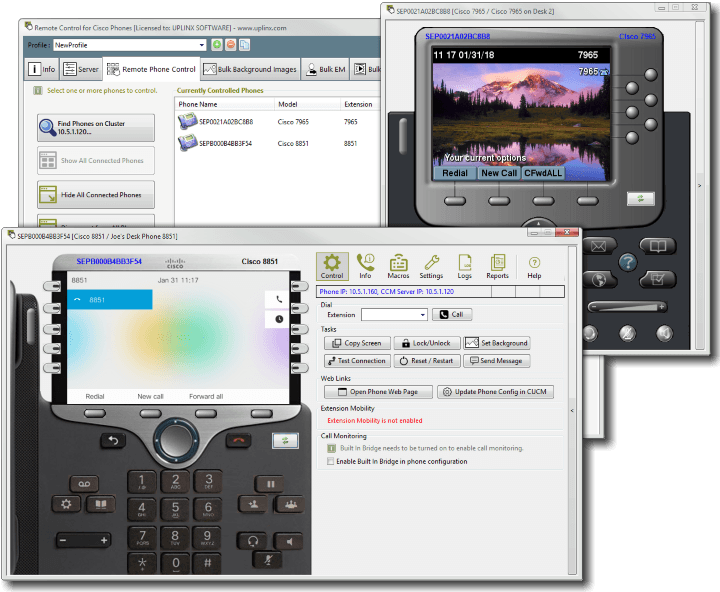 The UPLINX Remote Phone Control tool enables a phone administrator or help desk operator to remotely control Cisco phones from their computer. Phone operations that normally could only be performed locally at the Cisco phone can now be executed remotely without leaving your desk. Time consuming trips like ‘walking the floor’ for user support, to configure phones, validate settings or troubleshoot a reported issue are now a thing of the past. Join The 1,130+ Satisfied Remote Phone Users! Remotely log in and log out a user’s device profile for Cisco Extension Mobility. Script or perform status/login/logout operations. Background image deployment to Cisco phones. Erase invalid CTL-ITL files. Report on invalid CTL-ITL files on Cisco phones with the free for all CTL-ITL report and then erase invalid CTL-ITL files. Cisco Extension Mobility logout and re-login from a spreadsheet - ideal for migrations and upgrades. 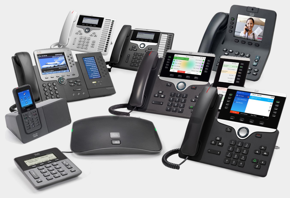 Configure any Cisco phone settings from your desk by sending key macros to a group of phones. Change phone settings which are only available at the phone (and not in CUCM configuration) such as ringtone or Ethernet settings. Bulk operations, which are included in the desktop (engineering) edition, can also be executed from the command line and scripted to allow scheduled or repetitive execution. Remotely log in an extension mobility profile, check the phone display and call your desk phone to troubleshoot without traveling or engaging end users or site staff. Support staff can remotely view and control a Cisco phone and talk an end-user through unique features which may be configured on their Cisco phone or User Device Profile, such as Group Pickup, Conference or Hunt Group. What is an ITL file? The UPLINX Remote Phone Control tool allows a phone administrator or help desk operator to remotely control a Cisco phone from their desk. Phone operations that normally can only be performed locally at the Cisco phone, can now be executed remotely from your computer. with the same level of control as if sitting at the phone. Test a remote phone from your desk by placing calls, changing settings and login or logout Extension Mobility profiles. Support for the latest Cisco phone models is included in software maintenance. 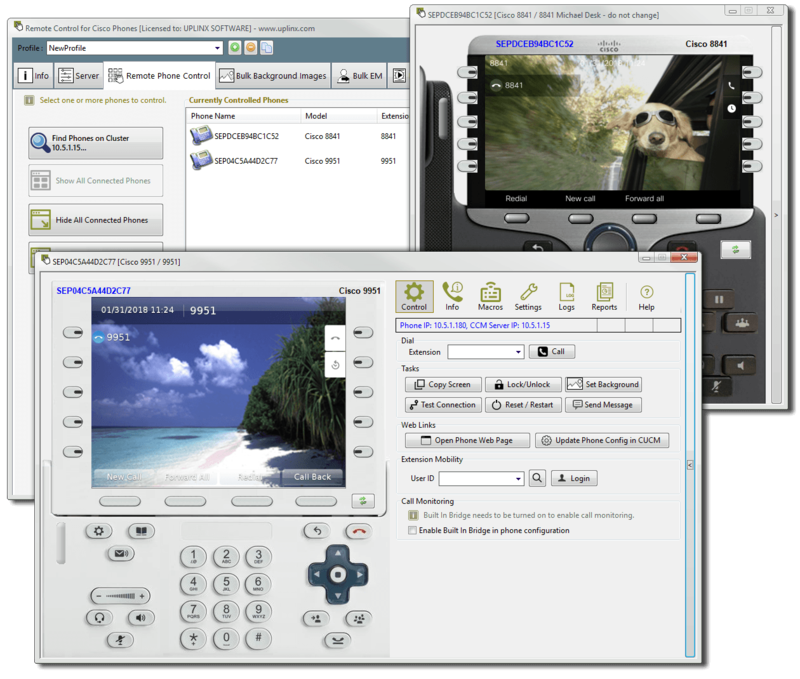 Desktop edition of UPLINX Phone Control is a Microsoft Windows application which is quickly installed and easy to use. 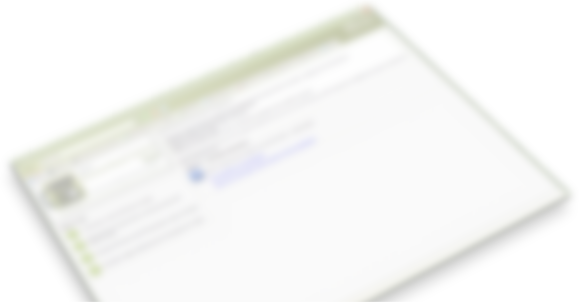 To get started, configure the CUCM server details and all is ready to go. JTAPI is used to control phones. 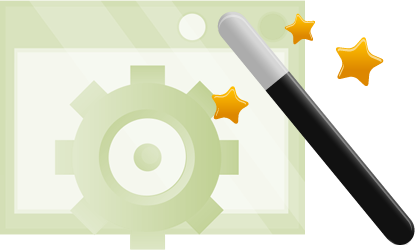 Bulk deploy background images to phones within minutes. 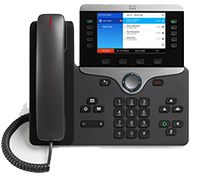 Images are automatically resized to suit any Cisco phone model. Erase CTL-ITL files from phones for Cisco CUCM server migration and upgrades. Please read more about ITL files on Cisco phones and important migration steps in our how-to migration guide. The FREE ITL report (no license required - included in trial version) checks Cisco phones for invalid ITL files to identify issues in your CUCM deployment. Record and replay key macros to multiple phones to apply settings to Cisco phones. For example to set the ringtone on a line. Download now and see for yourself. Windows application for Cisco project engineers and experts to remotely control and configure phones without leaving the desk. Can be used for a single phone or a group of phones in bulk. Finding invalid ITL files and Erase CTL/ITL files from Cisco phones. Extension Mobility logout and re-login from a spreadsheet. Set a specific ring tone per line. Screenshot a group of phones. Send text messages to phone screens for outage or emergency alerts. Tool operations can be executed from command line and in scripts. Pricing from $390 supports single CUCM cluster and unlimited phones! Pricing from $590 supports unlimited CUCM clusters and unlimited phones and includes all bulk wizards such as CTL/ITL erase for unlimited phones and unlimited clusters. Designed with security in mind, and optimized for active operational support. The web edition is designed for help desks and operational support of telephony systems in production. It runs on-premise on Windows Server. Web browser access requires no application deployment. Multi-cluster, multi-user support with granular auditing down to individual actions. Strong security with audit logs of logins and actions containing who, when and what has been done. Dedicated and granular access rules centrally managed and controlled. User access to Cisco phones can be limited per device pool, extension range and other filters. No CUCM administrator account is required to use remote phone control. Authentication of login credentials via Active Directory means no CUCM administrative access. Supports data and voice VLAN separation and firewalls with clear traffic flows from the Phone Control server to phones and the CUCM servers. User browser access is only to the Phone Control Tool web server, enabling strong security policies. Remote Phone Control helps me talk to users needing support, it shows all the details of the remote phone. The wizards allowed me within minutes to deploy background images and to log in Extension Mobility users.